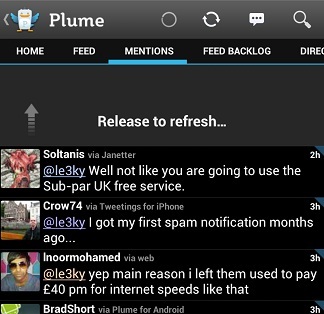 Plume is a great twitter app if you are looking to replace androidâ€™s stock app. Spring is in the air and there is no better time to do some cleaning out of your app closet and get some new fresh ones in! 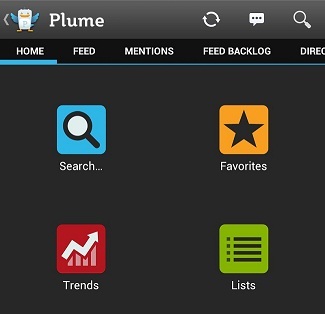 The home screen gives you direct access to your favorites, trends, lists, searching and column editing. Itâ€™s quite nice having a home screen where you can hop to different areas that arenâ€™t the timeline and mentions, especially if you have some lists and favorites that you visit frequently. 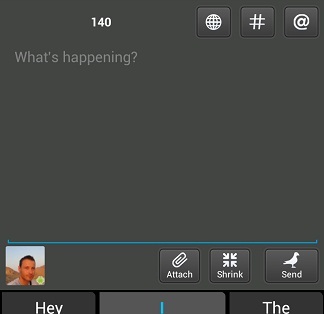 Getting from screen to screen (timeline to mentions to direct messages) is a simple slide of the finger. No clicking to get to what you want to see, just a slide. If you felt comfortable with the touching where you want to go, you still can as well. 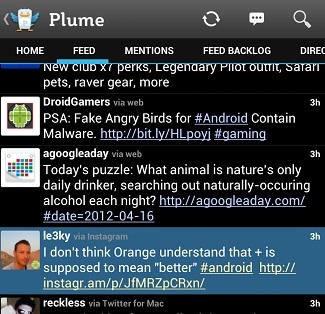 Itâ€™s all about options with Plume. Refreshing you feeds can be done by touching the refresh button or pulling down on the screen. Also, you can scroll around as you please or just touch the name of where you want to go. Touching the name again will bring you to the top of that screen. I liked that feature a lot, I didnâ€™t use the app overnight and instead of scrolling for a couple of minutes I could just hop up to the top with a touch. There is also a built-in browser, making loading pictures and links super fast and easy. Just by holding down on the post will get you there. You can do a number of things also in the settings area, change the font size, hide people's avatars, reverse the order of incoming tweets, alternative times and colorize the tweets (definitely helps distinguish tweets). You can mute users or words too, if you only want to see certain things. Tweeting itself is pretty great. Three buttons at the top let you throw a hashtag in instead of going to symbols, put an at sign in and the last one puts â€œhttp://â€ in for you when writing a link. Also when that link is written, there is a shrink button to shorten the links. Your pictures you attach can be uploaded with twitpic, plixi, yfrog, posterous, and mobypicture. The design is pretty intuitive. This is my 4th twitter app (OG android, tweetdeck, twicca) and I feel like I have settled in with it the fastest and most comfortably. Everything fits in really nicely in the screen. Especially on the home screen, there is tons of room, which is unusual for a twitter app. Everything is usually packed in as tight as possible. I have never had a problem with a force close or freezing or anything like that, which is frequent among other apps. Refreshing is fast, loading is quick and uploading is just as fast.